S4 E12 ‐ Kimmy Says Bye! S4 E11 ‐ Kimmy is Rich*! When Zach sells Giztoob for big bucks, Kimmy celebrates! Jacqueline hustles to keep Tripp as a client, and Titus learns a secret about "Cats." S4 E10 ‐ Kimmy Finds a Liar! Kimmy discovers that Fran Dodd is posing as the author of her book. Jacqueline sets Titus up in a fake relationship with a celebrity. S4 E1 ‐ Kimmy Is...Little Girl, Big City! S4 E2 ‐ Kimmy Has a Weekend! In the probing documentary "Party Monster," DJ Fingerblast investigates what became of his childhood hero, DJ Slizzard. S4 E4 ‐ Kimmy Disrupts the Paradigm! Kimmy tackles sexism at a tech conference while Lillian hits on men. Titus auditions for an acting troupe and researches nerds for a role. S4 E5 ‐ Kimmy and the Beest! Titus directs a school musical but misses being in the spotlight. Jacqueline and Lillian try to scalp tickets to parents. Kimmy confronts a blogger. S4 E6 ‐ Kimmy Meets an Old Friend! Titus struggles to come up with a pitch for "The Capist." Kimmy writes a children's book. Lillian meets Artie's kids. Jacqueline stands up for Xan. S4 E7 ‐ Kimmy Fights a Fire Monster! S4 E8 ‐ Kimmy is in a Love Square! Titus opens up about his encounter with Mr. Frumpus. Kimmy bonds with her date's parents and starts seeing them behind his back. What would life be like if Kimmy never got in the Reverend's van and Titus missed his audition for "The Lion King"? Kimmy faces new challenges as the head of HR for tech startup Giztoob. Meanwhile, Jacqueline signs Titus to her fledgling talent agency, White Talent. 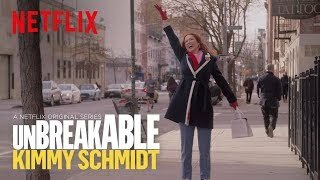 Currently you are able to watch "Unbreakable Kimmy Schmidt" streaming on Netflix.